Like Mohamed Lahouaiej Bouhlel, none of those detained were known to French intelligence prior to the attack. 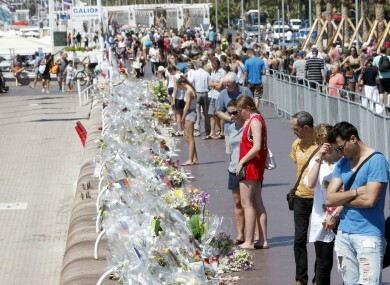 People look at flowers at the Promenade des Anglais in Nice. FIVE PEOPLE DETAINED after last week’s massacre in Nice are due to appear before a judge Thursday, as France is set to pass a law extending the state of emergency. The government is scrambling to reassure a jittery population after the country’s third major attack in 18 months killed 84 people out celebrating Bastille Day. France’s National Assembly and Senate are also set to pass a bill extending the state of emergency – which gives police extra powers to carry out searches and place people under house arrest – for six months. MPs yesterday also voted to allow authorities to search luggage and vehicles without prior approval from a prosecutor and to allow the police to seize data from computers and mobile phones. The Islamic State group has said the Tunisian driver was one of its “soldiers” but investigators say that while he showed a recent interest in jihadist activity, there was no evidence he acted on behalf of the extremist group. The group yesterday posted a video apparently shot in Iraq showing two French-speaking jihadists threatening more attacks against France. Email “Five arrested in connection with Nice massacre to face court”. Feedback on “Five arrested in connection with Nice massacre to face court”.